On the 16th June, Twist Consultancy will be celebrating our 2nd Birthday. To mark this occasion we’re running a competition to win some great prizes, including this specially commissioned Rubik’s cube. These are official original Rubik’s cubes, but using a new printing technology. No rubbish sticker prints on these bad boys!! Why a Rubiks cube? Well it captures the essence of our approach to helping you. Looking at something in a new way, taking what your business has & reshaping it to improve your marketing performance & conversion. Also available as prizes a half day ‘quick wins’ marketing review or an email training session, delivered at your premises. So “HOW DO I WIN ?” I hear you shout. Very simply you need to be on our email mailing list by our Birthday, the 16th June 2018. We’re creating a new monthly email to provide you our pick of the most interesting marketing topics & strategy tips & tricks. We’re also launching a brand new service on our Birthday which you’ll hear first via email…. come on, this will be worth adding to your inbox. And everyone is already a winner because simply by requesting our free step-by-step guide, ‘creating relevancy’ you’ll be added to the email list as well. Get the guide here. Want to increase your chance of winning – simply share any of our posts you see on LinkedIn, Facebook & Twitter including the #twistconsultbirthday to your comment. 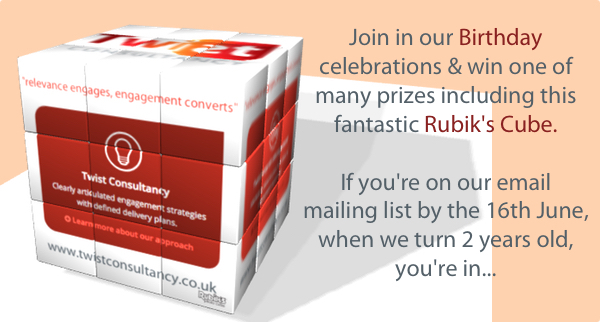 We’ll add in a further chance for you to be a lucky birthday winner. BOOM. Twist Consultancy is a direct marketing specialist helping improve how businesses connect to people. We’d love to discuss how we can help you better connect with your customers.